Are you in the market for new camo? Check out Monster Camo to satisfy all of your outdoor needs! Monster Camo strives to be the best in satisfying all of your outdoor needs! Whether you are looking for early season, mid-season, or late season gear Monster Camo supplies it! With their newly designed hunting line you will be amazed at the amount of technology incorporated into your all of your hunting gear! Blood-tex is a great piece of technology incorporated into the gear they make to ensure that all of the blood washes away, quickly, easily, and effectively. Scent-tex is also an amazing piece of technology meant to outcompete all of their competitors! Scent-tex incorporates an effective formula for all of your hunting gear that takes your scent and converts it into a scentless odor not detectable by the game you are chasing. To see the technology and quality incorporated into all of Monster Camo’s gear CLICK HERE! Whether you are in the mountains chasing elk, in Canada chasing black bear, or chasing that huge mature whitetail; Monster Camo is there to keep you invisible in any terrain that you might be in. 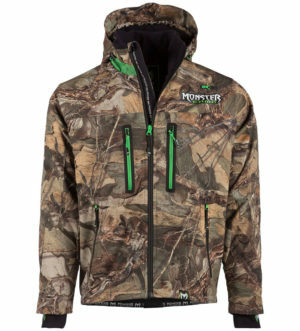 Monster Camo supplies a vast arrangement of jackets and pants to satisfy all of your outdoor needs. They supply jackets such as the M500, M600, M700, M800, XR125, and XR250 to keep you warm throughout the duration of the hunting seasons. 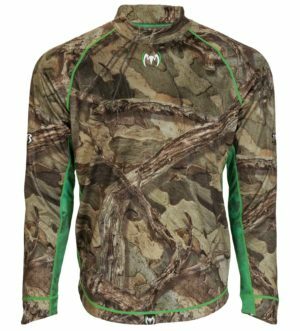 Looking for hunting t-shirts and long sleeves? Monster Camo offers the CR125, CR250, and CR500! A great early to late season base layer to keep you invisible and warm all year round! Monster Camo also supplies a variety of pants that allow you to create a suit that is tailored to you the hunter. Check out the KX125 and the KX250 to get the most out of every hunt. Want to know what suits Monster Camo has to offer? CLICK HERE! Interested in Monster Camo’s other gear? CLICK HERE! Between the great customer service, the amazing quality of clothing and the successfulness of the camo pattern, this is a company that will treat you right and make you more successful chasing game for years to come. Check them out today! You will not be disappointed!